Large plants from delicious white heads that are used fresh in salads, on relish trays, or cooked. When the heads are formed and hard they should be blanched by drawing leaves together and tying. Planting time - Late Spring to Early Summer or for early crop, start seed indoors in CowPots 6 to 8 weeks before last frost date. 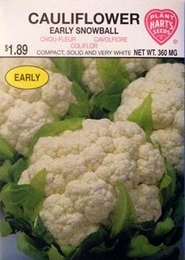 3lbs of Cauliflower seed needed per acre, 8oz needed per acre if using transplants. On average, 1oz of seed can produce 3000 Cauliflower plants.